Hard boil your eggs in boiling water (about 12 minutes), then cool in ice water. Peel the eggs and cut in half (long ways). Remove the yolks and reserve in a small bowl. Add the mayo, dijon, salt, pepper, curry and milk and whip until smooth. Fill each egg half with some of the yolk mixture. Top with paprika and chives to serve. I love deviled eggs! I like the looks of the chives on there. I think I’d double that and eat them up! Hi Jenny, With my chickens going into over time laying eggs,this recipe is being served at our house this week end. Mmm. Deviled eggs are one of my favs. Ive never tried them with chives. I am definitely going to try this recipe soon. 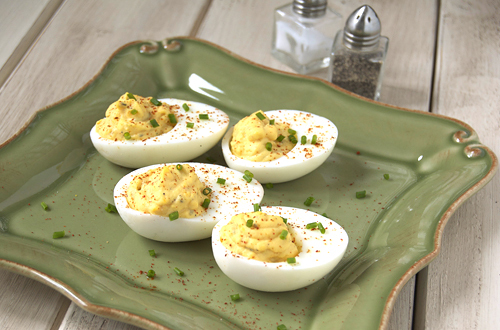 I love deviled eggs, and I love that addition of curry powder! Love love love deviled eggs!! That looks so yummy!!! 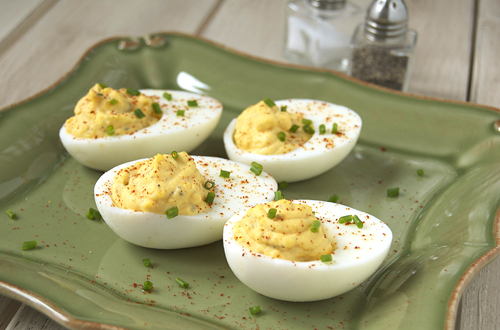 Fantastic deviled egg recipe! They look delicious! We don’t know about the superbowl as we are Greeks, however what you made is very tasty! We make a similar thing here as well and serve it on Easter! We take the yolks and mix them with black pepper, a teaspoon of fresh lemon juice, a tablespooin olive oil, salt and some drops of vinegar. Some others just add what I mentioned on top of the sliced eggs. Instead of chives which are a bit rare on the local markets in Greece, can we substitute with scallions?